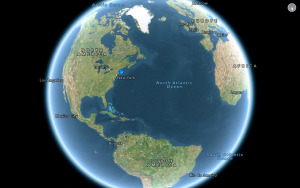 A great app for making snippets useful in a whole lot more places. Infinitely more configurable than iOS Notes, SnipNotes is part clipboard manager, part note-taking app. One of the most irksome things about Touch ID is that Apple requires users to sign in with a password every 24 hours, defeating the purpose of fingerprint recognition in the first place. That means there’s a good chance my next App Store purchase will be greeted by a password prompt, forcing me to remember that letter and number combination, or cut and paste it from 1Password. But I’ve actually found a faster way, by saving passwords for my Apple IDs as favorites that can be copied with a single tap from a Notification Center widget, then pasted into that nagging App Store prompt. And would you believe this miracle app also makes the same notes available on your Apple Watch? 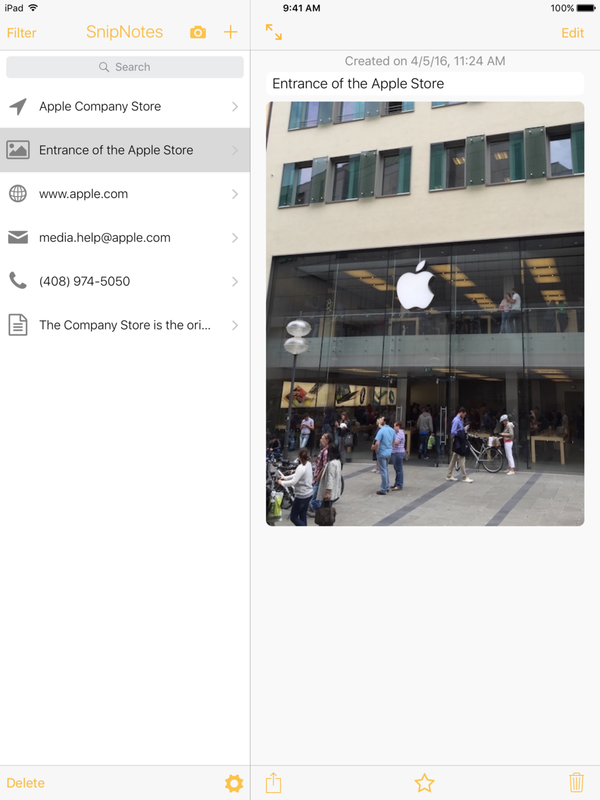 SnipNotes can take new photos or import them from the Camera Roll or other apps using the iOS 9 share extension. On the surface, SnipNotes ($3 on the iTunes Store) works a lot like Apple’s built-in Notes app. 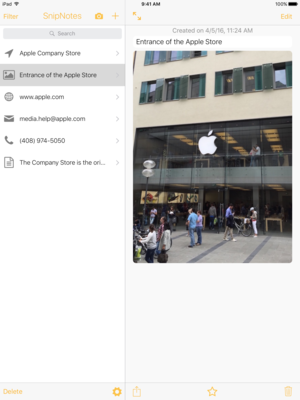 Users create, share, and search for notes with text, images, maps, or web links, which are synced between devices using iCloud. Although Notes has the upper hand when it comes to formatting and markup skills, SnipNotes is actually far more versatile in almost every other way. That’s because SnipNotes makes your data useful in more places, such as the interactive widget on the Today tab, which is accessible from anywhere on the device. 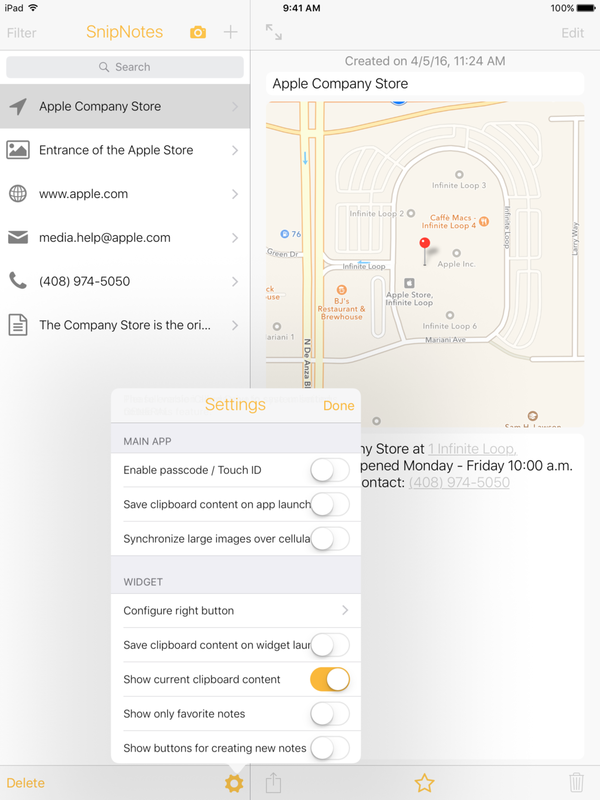 There’s a button to quickly save the current clipboard contents as a note, along with a second which can be configured as one of five actions, such as saving a map with GPS data for your current location. You can also tap and hold widget list items to call up bonus actions which can be customized from the main app. Available actions vary based on content type (phone number, hyperlink, email address, location, image, text) but include hooks to popular apps like Evernote and WhatsApp, third-party search services, and making calls. SnipNotes works great for notes of any length, but it’s best suited to smaller snippets of data, like those you might find on Apple Watch. Indeed, you can voice dictate new notes and view (or delete) existing ones from the comfort of your wristwatch, even when the connected iPhone is out of range or the note contains images. Take, that Apple Notes! 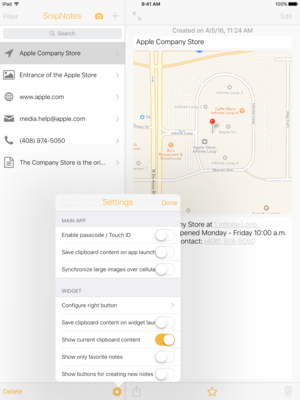 An interactive Notification Center widget turns SnipNotes into a powerful tool for accessing snippets from anywhere on your iOS device. Pardon the pun, but it’s the favorites feature that really made me sit up and take note of SnipNotes. Each item includes an optional header field, so I was able to paste my Apple ID passwords into separate entries with an easy-to-remember name (one for iCloud, another for iTunes), then pin them as favorites so they always appear at the top of the list. 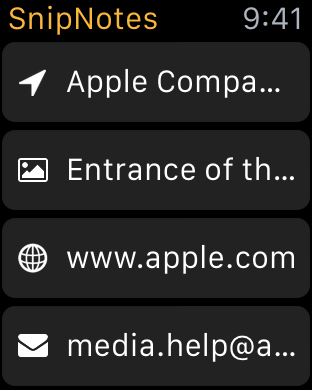 Now all I have to do is tap the header name from Notification Center to copy the contents (for example, my password) onto the clipboard prior to making an iTunes Store purchase. 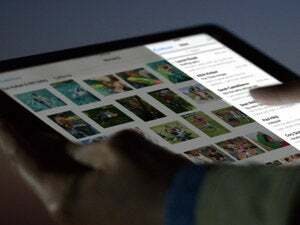 Content can optionally be secured with Touch ID, and since would-be intruders don’t have my passcode, fingerprint, or iCloud account, SnipNotes is a fairly safe and super-convenient workaround. Version 2.1 introduces the ability to organize notes into categories, each with an easily identifiable icon. It’s a great addition to the app’s existing search and robust filter options that really help manage an ever-expanding list of notes. Let’s see iOS Notes do this: SnipNotes works with Apple Watch, allowing users to view notes or create new ones with voice dictation. While SnipNotes has definitely become part of my daily workflow, you’ll want to keep Apple Notes for more involved note-taking. SnipNotes lacks the powerful formatting and markup features Cupertino added to Notes with iOS 9, and there’s currently no macOS version, although the developer promises one is on the way. SnipNotes isn’t quite ready to completely replace Apple Notes, but it’s still a great app for making snippets useful in a whole lot more places. A cross between a note-taking and clipboard manager app, SnipNotes makes it easy to create and share text or image notes from everywhere on your iOS device.